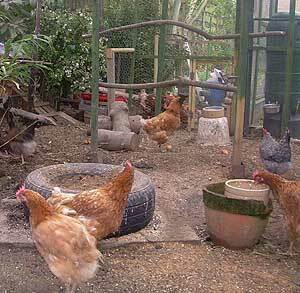 When to start keeping Chickens? 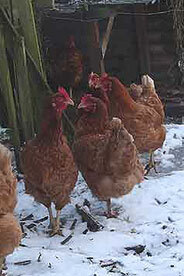 People often ask me "When is the best time of year to start keeping Chickens in the back garden?". After keeping Hens for quite a number of years, I have to reply "No time is a bad time, but there are times which are better than other". Now that may sound a bit of ducking out going on, but to be fair I think I'm near the mark with it. It also depends on Breed etc. Most of the Chickens we get are from Breeders and at point of lay (between 12 and 22 weeks old) and the chances are they've spent most of their time inside, so the outdoor life will be new to them. It's avoiding the extremes really, mid winter with six inches of Snow isn't perhaps the best time and sizzling weather of 30 degrees isn't either. Saying that, of the two I'd rather introduce in mid Winter than mid summer as I've found I have lost far fewer newbies during Winter than I have through Summer. For me, living in Kent, the best times are late February to late May and late August to November. These times give them the best of both worlds, they are seeing gradual seasonal change either hot to cool or cool to hot, but I do emphasize this is personal preference and not said as done. Ex-Battery Hens are another matter. You can see from the photograph on the right that it would not be the ideal to have a featherless Chicken running around in the snow or in very hot weather when they are open to harmful sun rays and the other Bugs which attract themselves to Chickens through the Summer months ie. Red Mite etc. What I would put in at this point is that I personally don't go along with making coats for ex-battery hens in Winter, rather make them cosy and snug than having something artificial to them tied around them. The more natural any creature can be the better. 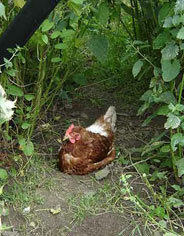 In Summer Chickens will keep themselves cool by finding shade. Their natural habitat is Grass and Woodland, so the more they have to wander around in the better. I was surprised to find that mine actually like strolling through the very tall Stinging Nettles. On hot days, if I can't see them, I'll throw some food into the run and out they all come! So, my original answer is usually when people are going to house them in smaller Runs etc. If you have converted a shed into a Coop with a large area run with shelter inside, any time of the year is perfectly fine. It's just keeping an eye on them. In that light, a smaller Coop and Run for ex-battery hens is quite OK with ex-battery hens. One last thing to consider is yourself (always second in Chicken Keeping). They need a lot more attention through Winter, the nights are long so there's more poo about! Plus of course an induction to your new adventure is not so enjoyable when you have to tramp up the far end of the Garden in slippery Mud or Snow still wearing your Dressing Gown!